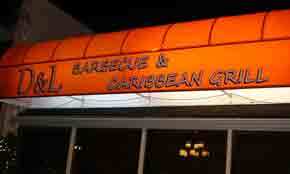 This new Bradley Beach Southern Country-Caribbean fusion restaurant has moved from it's previous Asbury Park location. The food is very good and the prices are reasonable. Owners Lisa Provost and chef Devon McLean serve up well prepared southern style cooking with a Caribbean influence. The menu has many selections of southern style BBQ chicken, ribs, and pulled pork, catfish, jerk wings, and Mac n Cheese. They continue to serve their famous "Fall off the Bone Ribs", "Barbecue Chicken", "Chicken & Rib Combos while adding some new specials. Best dishes to try are the Curry Chicken, jerk Chicken the slow cooked Beef Brisket, and the Grilled Red Snapper, and Gumbo. For dessert, try the Bread pudding with custard and a delicious brandy sauce; or the Sweet Potato Pie with molasses. They are kid friendly with an inexpensive children's menu. While reservations are recommended, you can generally be expected to be seated without a reservation.